Take steps to prevent your property from being violated. Waking up in the morning and finding your car was broken into (or stolen) is not a good way to start your day. Although some break-ins are not preventable, there are certain steps to take to reduce your chances of seeing the dreaded broken glass on the ground. We’ve compiled a few for you. Locking your doors. This might seem obvious, but there are many instances where the car was broken into while unlocked…and while the keys were in the ignition! Cleaning it up. You should have nothing visible, if at all possible. Clean out the fast-food meal you haven’t gotten rid of since last week (c’mon, you weren’t saving those fries for later) and ensure your seats are clear. Removing your electronics. Leaving your iPod or car phone charger visible is saying that you have an expensive electronic, and that it may or may not be still in the car. Put any evidence of your electronics away or take them with you. Stashing your stuff before you leave. That means putting your things in your trunk before you arrive at your destination, not after. Thieves often wait and watch people who are leaving their cars before they attempt to make a move. Displaying deterrents. A wheel lock or an anti-theft alarm sticker will go a long way to avoiding a break-in. And installing an alarm system is not only a thief deterrent, it might actually help you save money on car insurance! Two birds with one stone! Don’t give a thief any reason to see or suspect you have valuables in your car. 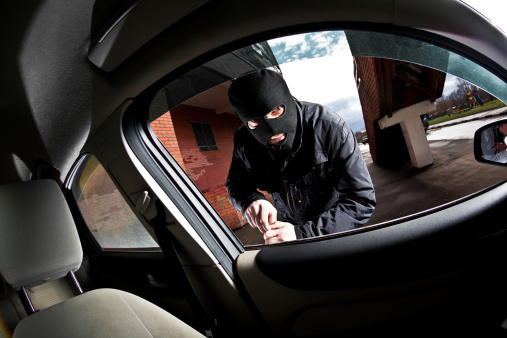 Lock your car up, install an alarm system and keep your car parked in a well-lit place overnight. It might not be able to prevent all break-ins, but it can at least make a thief think twice.